Zimbra collaboration suite is an enterprise-grade mailing solution with a rich AJAX-based user interface, advanced sharing capabilities, and hassle-free migration/deployment. It is compatible with all popular web browsers, email clients, and OS devices, thereby helping businesses stay connected with their communication 24x7x36, who use this service. Zimbra mail server services enable to integrate or extend 3rd party communication platforms, customize through Zimlets, and ensure easy administration. In simple words, Zimbra email hosting is an easy solution to enjoy a rich and cost-effective email communication. Founded in 1998, Synacor is the trusted technology development, multiplatform services and revenue partner for video, internet, and communications providers, device manufacturers, and enterprises. Synacor delivers modern, multiscreen experiences and advertising to their consumers that require scale, actionable data and sophisticated implementation. Enterprise-level text messaging and videoconferencing right in the Zimbra Web Client, with no third-party products or extra installation steps. Give your users everything they need to collaborate with coworkers and beyond, all inside the communication tool they use the most – email. Zimbra Drive is updated file sync and share functionality. Built on the ownCloud/Nextcloud platform, Zimbra Drive provides seamless synchronization and sharing of files between your users, wherever they are and on any device. 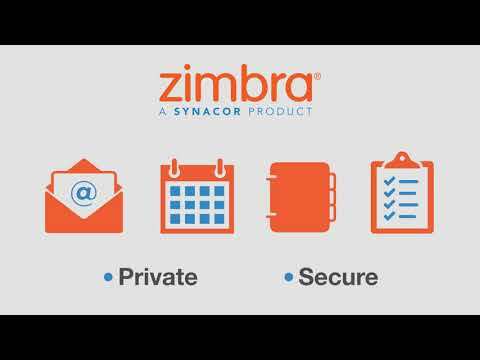 Now available in all versions of Zimbra! Peer-to-peer chat using XMPP. Know your company’s chat data is secure and private while your users enjoy searching chat history, emoticons, etc.